The temporomandibular joint (TMJ) is the joint between the temporal bone of the skull and the mandible or jaw. The TMJ can be easily felt just in front of the ear when you open and close your mouth. It is a synovial joint, meaning it has a joint capsule and synovial fluid to lubricate and nourish the structures within the joint. 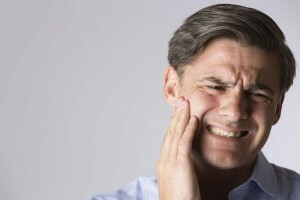 We have a TMJ on each side of our jaw, allowing movements including, opening the mouth, side-to-side deviation of the jaw and protrusion and retraction of the jaw. The TMJ has a small articular disc, which is similar to the meniscus in the knee and can become problematic if stressed or injured. Normal TMJ function is critical for speech, chewing, swallowing, and dental health. Pain in the jaw, which is often exacerbated with chewing, yawning, speaking or opening the mouth wide. Pain can also be felt in the face, neck, ear, or head. Applying an ice pack may be helpful.